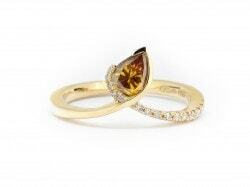 18ct Yellow Gold Crossover Style Ring featuring a Fancy Pear Shaped Cognac Diamond and Micro Claw Set Diamond Shoulder. Prices From £4250.00 but this particular commission pictured was £4250.00. We are always happy to work to a budget if you have one in mind.